‘Snowflower and the Secret Fan’ is a film by Wayne Wang who is probably most known for his film ‘The Joy Luck Club’. Over the years Wang has directed movies such as ‘Smoke’, ‘Because of Winn-Dixie’, and ‘Maid in Manhattan’. These are a far cry from ‘Joy Luck Club’, ‘A Thousand Years of Good Prayers’ and his most recent ‘Snowflower and the Secret Fan’. I must say I am happy to see Wang return to the Chinese American storylines in his films. He does this effortlessly. 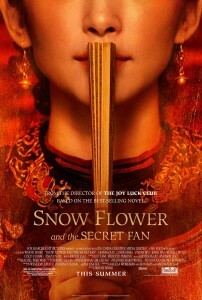 ‘Snowflower and the Secret Fan’ is based on the novel by Lisa See. “In 19th-century China, seven year old girls Snow Flower and Lily are matched as laotong – or “old sames” – bound together for eternity. Isolated by their families, they furtively communicate by taking turns writing in a secret language, nu shu, between the folds of a white silk fan. In a parallel story in present day Shanghai, the laotong’s descendants, Nina and Sophia, struggle to maintain the intimacy of their own childhood friendship in the face of demanding careers, complicated love lives, and a relentlessly evolving Shanghai. Drawing on the lessons of the past, the two modern women must understand the story of their ancestral connection, hidden from them in the folds of the antique white silk fan, or risk losing one another forever.” – Per Fox Searchlight. This story is told through two different sets of girls in different generations. These two girls are known as laotongs or sisters as we would call it. They are not sisters by blood, but rather arranged to grow a loving and close bond between two women. The film takes place present day and back a few hundred years ago going back and forth between the two generations as we see the similarities between the two sets of laotongs. We journey with both sets of women as the grow up and eventually begin to grow apart. Life happens and the girls reunite when sometimes tragedy strikes or big announcements are made. It was overall heartwarming, but quickly fizzled. I think these sets of girls friendship is supposed to be epic and quite extraordinary, but after watching it only seemed to be condensed. This took away from the overall them of the film for me. I must say that Hugh Jackman has a surprisingly big cameo in the film. Sadly he is not Wolverine, but he does sing and dance in the film. Jackman out of nowhere. I know what Wang was going for. He wanted to make an emotional and somewhat of a coming of age movie between these girls, but sadly it came across as unmoving and comatose. I know this doesn’t appeal to my demographic, but I can’t really see the film moving anyone, even its intended demographic. My thoughts and discussions after the film ended were right in the middle of good and bad. It has its moments, but they are to far apart. And I don’t think I’d ever watch this film again. If you have a best girlfriend who just know you will be friends forever with, then maybe you and your best friend will enjoy it for a one time viewing, other than that I’d skip this film. This entry was posted on Wednesday, July 27th, 2011 at 8:08 pm	and is filed under Film, News. You can follow any responses to this entry through the RSS 2.0 feed. You can skip to the end and leave a response. Pinging is currently not allowed.